Part of Phase 4 of our 4-step air compressor system service is air compressor repair. With our high-quality products, expert installation, and scheduled maintenance services, we anticipate that your needs for air compressor repair will be minimal. However, all machines with moving parts break down eventually — and when they do, The Titus Company is here to help. What Is the Purpose of Our Air Compressor Repair Service? Our air compressor repair service is in place so that if you ever have any problems with your air compressor system, one of our highly trained air compressor technicians can get to your location as soon as possible to fix it. How Does Our Compressor System Repair Help Businesses? We understand that when it comes to air compressors for your business, minimizing downtime is crucial. That’s why our technicians are trained to fix your air compressors correctly and fix them fast, so you can get them back in operation as soon as possible. 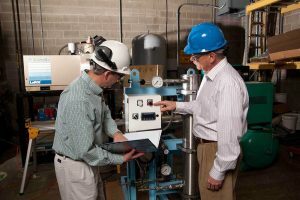 For many industries that rely on these systems, every minute that your air compressor system is not working properly could be costing you money or endangering your product, so you want to make sure you are working with a compressor system repair service that knows how to fix your equipment as quickly and efficiently as possible. What Are the Benefits of Our Compressor System Service and Repair? Fixing your air compressors and related equipment fast is just part of eliminating downtime. There’s also the issue of getting them fixed right now. We know that when equipment does break down, it doesn’t do so according to anyone’s schedule but its own, which is why we offer 24/7 emergency air compressor repair service. We’ll repair your air compressor equipment according to your schedule, not ours, so if you need repair immediately, just call us and we’ll be over right away. How Does This Service Integrate With the Other Products and Services The Titus Company Offers? Our repair services, including on-call service technicians and 24/7 emergency service, is the backup plan that ensures you that if something should go wrong with that system, it won’t be amiss for very long. Combined with our quality products, design and fabrication services, top-notch installation, and preventative maintenance, you can be confident that your air compressor system won’t let you down. Why Choose The Titus Company for Air Compressor Service and Repair? We know air compressors and related equipment — especially if your air compressor system consists of products we have sold you or installed for you. There is no one better to trust with the repair of these machines. We work quickly and at reasonable rates. Once you have joined the Titus family, you can relax in the knowledge that if your air compressors are ever not functioning as they are supposed to, we will resolve the problem fast. For any and all air compressor repairs, or to inquire about any of our air compressor system services, contact The Titus Company today. Copyright © 2019 The Titus Company. All Rights Reserved.